We saw it with "Victoria" and we are seeing it with "The Crown": Whenever a new period drama comes out, articles on the matter of historical accuracy are bound to pop up sooner rather than later. It is all too understandable, after all period dramas often revolve around actual historical figures. Yet, the viewer shouldn't forget that they are watching a fictional movie or TV series, after all they are telling a story, not making a documentary. 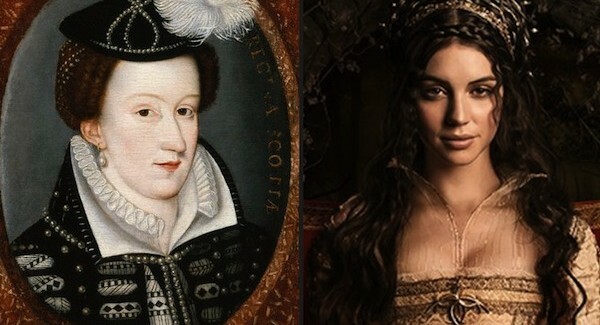 No one knows what Henry VIII told Anne Boleyn or what the Duke of Edinburgh told the Queen before her coronation. Though I admit, there seem to be shows where historical inaccuracies bother me more than others. There are different kinds of period dramas. Some of them do depict novels, others are entirely made up. Then there are the ones who want to portray historical events and others take historical figures and make up there own story. Take "Reign", for example: The series took historical accuracy and simply ran into the opposite direction. There's a fictional half-brother to King Francis named Sebastian playing the third person in a love triangle between them and Queen Mary, the clothes Mary and her ladies wear would be more at home at a fashion show in Milan and the series starts out with Mary playing football in a convent, which makes you roll your eyes so badly, it hurts. (I can't be the only one who knows that modern football (or soccer) was invented in 19th century England and not 16th century France.) Yet I still somehow enjoyed the show as from a first glance I was all too aware that they never set out to give an accurate portrayal of Queen Mary's life, it was and is simply as soap opera set in front of historical events. Take a very current show as a second example: ITV's "Victoria". I like the show and it's way better than I imagined it. Yet there were a few things that bothered me and the inaccuracies were way less visible than in "Reign", you actually needed to know history to notice them. The first season just finished and a second one and Christmas special for 2017 are already commissioned - hurrah, three cheers! -, however, for the most part of the show, it seemed to have a major uncle issue. First there was the King of Hanover (or the Duke of Cumberland like the show continued to call him despite him being the ruler of his own kingdom), who lingered around for far too long waiting for his niece to to mess up. In reality, he arrived in Hanover eights days after becoming their King and didn't return to England for years. Though admittedly he did make a good villain with his (historically accurate) scar. Then there was the King of the Belgians, Leopold. He also didn't seem to have much work to do at home in Brussels even having the time to travel with his nephews Prince Ernst and Prince Albert from London to Coburg in Germany and back to London. And on top, there was the whole Vicbourne storyline about Queen Victoria and Lord Melbourne that I don't really care to get into because we all know that it is the Victoria and Albert Museum, the Royal Albert Hall and the Albert Memorial. So yes, I did take a bigger issue with the historical liberties "Victoria" took than I did with "Reign", where I didn't even bother to think about it anymore. That is, I think, because "Victoria" actually set out to portray the actual Queen Victoria, in difference to "Reign" that just needed some inspiration and fancy castles as its backdrop. Don't get me wrong though, I would still recommend you to watch "Victoria" over "Reign" any day. Truth is stranger than fiction, they say. But the reality of things is also that the truth can make for a pretty boring story. Girl meets boy, they fall in love with each other and live happily ever after doesn't make for a compelling story. The Brothers Grimm knew that and Hollywood knows that. There have to be a few bumps and obstacles along the way, otherwise the viewer will get bored and stop watching. The truth is also that we do not know the truth. What really goes on behind closed doors, what conversations happen and do not happen, we do not know. With historical royals it may be easier because letters and diaries may be available but they will also only paint one part of the story. So even a documentary will always have a bias and may venture into the field of speculation. One of the very current examples of a TV series being dissected before it even airs is "The Crown" telling the early years of Queen Elizabeth II's reign. One bit that seems to cause the most debates is whether Prince Philip actually did refuse at first to pay homage to his wife. The truth is that we do not know. I'm not saying it actually happened but we also don't know that it didn't. Of course the Duke of Edinburgh was a royal by birth and knew what was expected of him but do we really think that he did not struggle with his position and to bow to the woman that was first his wife, who also happened to become the Queen? It may not have happened in reality but is it unimaginable for a man born in 1920 who grew up in a world that clearly valued boys more than girls - succession rules anyone? - to mind to always walk two steps behind his wife and bow to her? In a nutshell (and you are more than welcome to disagree): I do mind it more when someone is described as "His Royal Highness The King of Hanover" or as a "Prince of Greece and of Denmark" than when there happen conversations and arguements that probably didn't as long as they are logical and possible. It's entertainment, not a history lesson.